Start-Up Chile offers $40,000 of equity-free funding to entrepreneurs who move to Chile for six months to work on their projects. A year ago, Hugo Bernardo thought he was right where the co-founder of a tech startup belonged: Silicon Valley. Now, he's running his company Easy Vino from South America and most of his customers are restaurant owners in São Paulo. What changed? Bernardo took advantage of Start-Up Chile, one of several South American initiatives luring entrepreneurs from abroad. In 2010, he moved to Chile where the government gave him $40,000 to help grow his business. He's not alone. Since 2010, the Chilean government has offered $40,000 of equity-free funding to startups accepted into its program Start-Up Chile. The governments in Brazil and Colombia back similar programs and Peru soon will too. In the last three years, Start-Up Chile has accepted more than 750 companies, 25% of them from the United States. 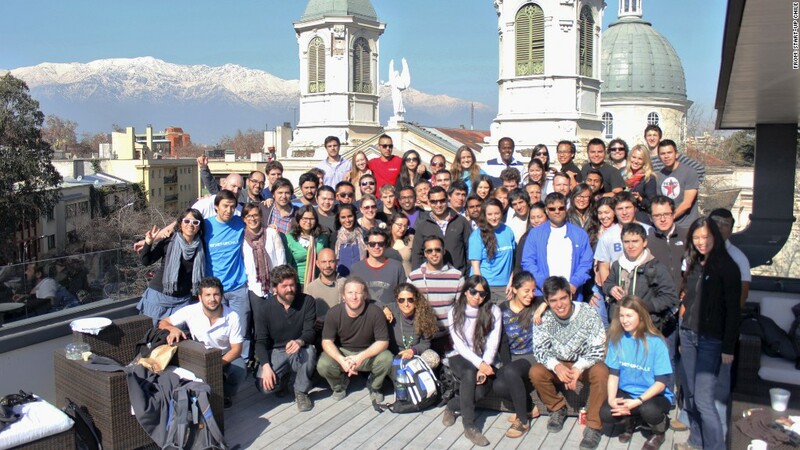 In return, business owners must move to Chile for six months and mentor local entrepreneurs. The seed money was the main reason Bernardo relocated, but he found an added bonus. The market in Santiago is even better than San Francisco for his service, which advises restaurant owners on developing wine lists and provides a mobile sommelier-like app for their customers. There's a lot less competition in South America, he said. It's easier for his sales team to get the ear of restaurant owners when they're not bombarded by tons of Silicon Valley entrepreneurs who think their product can revolutionize the industry. Bernardo has since branched out to São Paulo, Brazil, a larger market with even more restaurant owners interested in his pitch. Although funding might be the primary draw, South American incubators are instrumental in helping to obtain proper visas and open bank accounts. "Everything down here takes a long time," said Sean Kilachand, who will receive about $88,000 over the course of a year from Start-Up Brasil to launch his company. The money must be used to hire local employees for EduSynch, Kilachand's educational assessment service. Kilachand, a former New Yorker, knew few people and didn't speak any Portuguese when he moved to Brazil in January. Without help from the government-backed program, Kilachand says he might still be waiting for the correct visa. When John Njoku signed up for Start-Up Chile, the program not only helped him and his team at Kwelia obtain visas, but they had Chilean ID cards and personal bank accounts set up within two weeks of arriving. After spending six months in Chile working on their software, which provides data about apartment rental prices for property managers, the team decided it was best to return to the States. Only about 15% of companies stay longer than the six months it takes to complete Start-Up Chile, but that's "totally fine," said Horacio Melo, the program's executive director. In fact, he helps companies relocate if business will be better for them elsewhere, so that they grow a global entrepreneurial network with ties to Chile. That network is valuable to entrepreneurs in Chile, and local startup owners are already benefiting from having foreigners -- mostly tech entrepreneurs -- there for six months. Instead of asking for equity, the program asks for what Melo calls a "social return." Program participants must mentor Chilean entrepreneurs and speak to students at local universities. Melo says the program is working, pointing to the growing number of Chilean startups that apply for the program. In the first few rounds, there were no Chilean entrepreneurs accepted. In its eighth round, there were 14. For many entrepreneurs in South America, the growing network of startups is more valuable even than the seed money. Startup Buenos Aires -- launched this year by U.S. expat Lisa Besserman -- doesn't provide funding, but does offer weekly classes, a coworking space and hopes to ultimately bring college students from around the world to intern at Argentinian startups. It already boasts close to 700 members. "The tremendous growth further exemplifies how much of a need there was for this," said Besserman. "They were waiting for it."